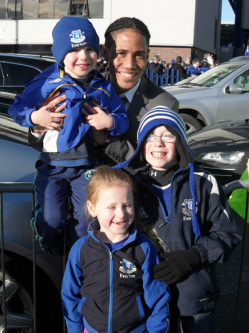 James Doherty has kindly put together his memories from this year’s Junior Blues Trip, it was obviously a very special trip for the Doherty Family as their eldest son Caoimhín won the draw to represent the Irish Toffees as the official mascot for the game…. Leaving Derry at 9am on Thursday morning the Doherty Clan were in a tired, but excited mood. Heading down over the Glenshane Pass in South Derry on the way to Belfast on a cold wet morning is enough to dampen the spirits of anyone, but not us. We were starting out on a trip of a lifetime to see our beloved Everton play Man U on Saturday morning, and this time it was going to be a bit more special for us as our eldest son Caoimhín was the official mascot for the game! Thursday was gonna be our quiet day so me and Kev took one for the team and let the girls go shopping while we had to watch the kids(in the hotel bar). About 2 pints later, as we were only sipping over the pints, the girls came back and after getting freshened up we went for a bite to eat, a few more drinks and back to the hotel. We all retired for the night except Kev who held up the bar for another couple of hours. Friday Morning - This is it, the official start to the weekend of activities. After 2 pick ups at Albert Dock and Vernon Street we were off to Goodison in our Double Decker for a tour. We were met by the always friendly and courteous tour guides and off we went in 2 groups to have a good nosey around our old but beautiful stadium. No matter how many times you do this tour it is always brilliant and fills you with pride. Then it was off to the Megastore to get fleeced by the kids who want everything and anything. I reckon we spent enough in the Megastore between us all to pay one of the players wages for a week! A quick bite to eat was had by all and back on the bus. Next stop was our training session - As per usual all our kids got treated absolutely brilliantly and they were all put through their paces by 2 of the Academy coaches, one of whom had coached the likes of Rooney, Anichebe, Vaughan, Baxter and Richard Dunne! After the kids training session it was back on the bus. Everyone was going to get the gladrags on for a night of Karaoke in the Premier Inn Vernon Street, hosted by none other than Joe O'Reilly and there's no show like a Joe Show! The kids all had a crack at it and we had some great renditions of some of the current pop/rap songs. All the kids who took part got an Irish Toffees badge and the best 3 acts were rewarded with some nice trophies. Then the host had a go and everyone went to the bar and it wasn't until some handsome young fella from Derry got up and sang a magnificent version of Robbie Williams' Angels that they all started flocking back in. It was an early night for the Doherty clan then as we had to get up early in the morning to make our way to Goodison for 10am. I set the clock for 8 and woke the star of the day Caoimhín who was about to embark on one of the greatest days of his life. He asked me what time it was and when I told him he said "I can't believe I never woke up during the night with excitement"! After breakfast we headed out to Goodison. We went into the reception area and informed them that Caoimhín was the mascot and they invited us through where we were met by a lovely girl who was to look after us for the next few hours along with John Hines ( I think this was his name). 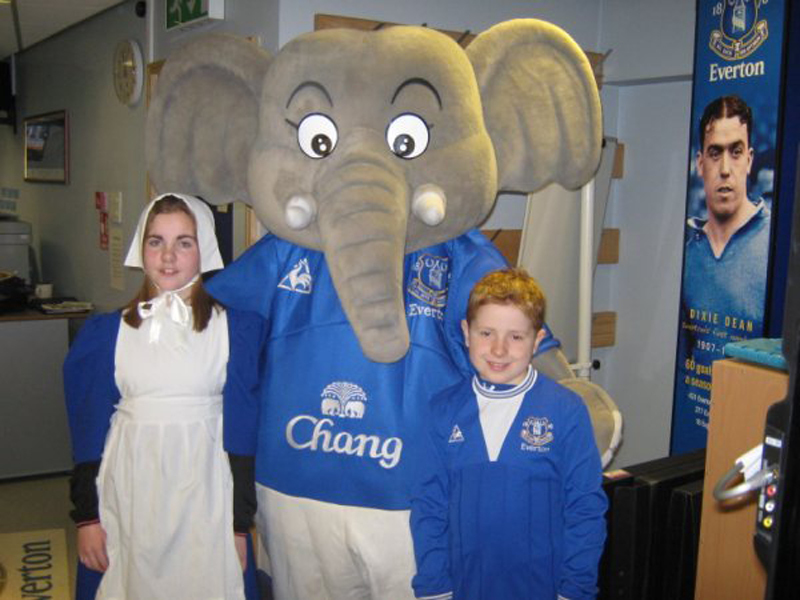 We then met up with Emma Murtagh, the Toffee Girl for the day and some of her family and we all followed our hosts into the Everton Extra Time suite, which is a fully fitted computer room with about 20 PCs which are used by several local youth and community groups. Tea and loads of food were laid on for us and the kids received a full Everton Kit from John and off they went to get kitted out. The kids were then taken down into the changing room area to meet the players and staff and got all their autographs and photographs taken with the players by Everton’s official photographer. They must have been down there for an hour or more and Caoimhín said it was great and they got to chat to the players. When they returned they all had big happy faces on them. They had just got to do what most kids only dream of and that is to meet their heroes in the changing rooms before a massive game against Man U! This for me is why Everton really is "The Peoples Club" and the Irish Toffees is the best supporters club in the world. No other club would do this for the kids and with the training session the day before it really is a truely unique bond we have going between Everton and our Club in Ireland. This was all made possible by the hard work of our former Chairman Jim Kearney R.I.P who worked tirelessly for years on building a connection between Everton and the Everton fan base in Ireland. About 12 o clock things started to get hectic in the room we were in. The Chang Elephant was getting kitted out, the toffee girl Emma had to get her outfit on and there were people running all over the place. A few pics of the Caoimhín & Emma were taken and on John’s instructions we made our way out and onto the side of the pitch. I have to say it was unreal, the both sets of players were out doing their pre match warm ups and we were like standing watching them from about 10 yards. Cameras out again and loads of pics and videos were taken. The kids were taken out to the nets at the Gwladys Street and were taking shots into the goals in front of what was now approaching 40,000 people. Where would you get it? The players retired to the changing rooms and we were now a few minutes away from kick off. Emma got her basket and started walking along the pitch throwing the toffees into the crowd, what a feeling she must have had. It was great to see a young girl from Ireland getting this privilege. The mascots were now brought to the end of the tunnel and we awaited the famous Z Cars, I was looking at Caoimhín and he was buzzing with excitement and I was excited and very proud that my son was about to lead our heroes on to the hallowed turf. I have to reveal a long held secret, I wrote to Jim'll fix it when I was about 9 asking if he could get me to play on Goodison Park with Everton and he never even replied, but here almost 30 years later my 9 year old son was about to do just that!! It was like a dream come true. Then it happened, the Z Cars was echoing all around Goodison and the hairs were standing on the back of my neck and up from the tunnel to a huge cheer came the players. Phil Neville put his arm over to the mascots and walked them out to the centre circle. I was nearly crying with pride and joy. I stood at the side of the pitch watching as the kids went down towards the Gwladys Street with Phil Neville for a bit of a kick about. Caoimhín was in his element. Then the kids were lead off and out we went to get our seats in the family enclosure before kick off. The Match - The game started and the atmosphere was great as usual. Then suddeenly from nothing really Berbatov stuck one in off the bar and we were 1 down. The United fans were now in full voice and we were a bit quiet. Then a left foot thunderbolt from Billy shut the Mancs up and it was now our turn. The place erupted and we were now in the ascendancy. Again on the break Rooney was through only to see Neville muscle him off the ball and I breathed again! The half ended all square. The second half was ours but we couldn't get that second goal. Moysey decided to freshen things up and brought Super Dan Gosling on. It wasn't long till a great move down the left resulted in a ball being played in to the box and there was Super Dan to steer it into the corner and the roof nearly came off the Old Lady!!! We were beating United and deservedly so. Fergie made a couple of changes to try to get a point but Moysey counteracted this by putting Rods on and boy did this work a treat. After a scare from a late Rooney free, United never really threatened but it was still such a relief when Rods went on a solo run from an Arteta through ball and finished superbly to put the 3 points on the board and send all us Evertonians wild!! We had beat up Man U and boy were we gonna celebrate. Saint Michaels Irish Centre - We all started arriving from 8:30pm onwards and soon the place was full of Irish Toffees. It has the cheapest drink in town so needless to say the drinks were flowing. It started off with a few words from Tommy Walsh and Patrick from the centre. We were welcomed to St. Michaels and heard about the importance of the Centre to the Irish community in Liverpool. We were informed that Sheeds couldn't be with us as his parents were ill, and i'm sure everyone had a quiet thought and prayer for him at that time. Joe O'Reilly then went up and said a few words on behalf of the Irish Toffees. After all the greetings and such it was time for a Q&A with former Blue Ronnie Goodlass with Darren Griffiths as MC. Ronnie talked of his time playing with Everton and the great players he played with. He spoke of the Irish players at the club in his time and the links between the club and Ireland to the present day. It is always great to hear former players relay their memories and stories about the Blues. After the Q&A, MOTD came on the small screen in the corner of the bar and we all flocked around to relive the excitement of the game only a few hours earlier. Cheers erupted at every blue goal. Then it was disco time and the kids were going mental on the dance floor and having a ball and with all the soft drinks on board some of the older members of the Irish Toffees, they started to strut their stuff to old and current beats. The place was alive with happy Irish Evertonians and we had a great nights’ Craic. All in all this was a great weekend for the Irish Toffees and it was great to meet up with all the families from all over the country again. We (the Doherty family) are forever grateful for having one of our sons as mascot and we are so proud to be members of the Irish Toffees. I have in the past defended the Irish Toffees as an All Ireland Club against some people from outside our club who say it is a Dublin Club. I reinforce my opinion, not just because our son was the mascot, but because this really is an All Ireland Family club and we all have made great friends from North, South, East and West (and the middle lol) of the country and these friendships will last forever. I can't wait till next years Junior Blues trip because they get bigger and better every year and we will be going for 6 in a row! I can't finish without saying a big Thank You to our hard working committee for organising another successful Junior Blue trip. Thanks lads and Lasses yous are top class!